On Aug. 19, 2018, the U.S. West Coast was shrouded in smoke as more than 1.9 million acres had been — or were currently — on fire. Recent satellite imagery shows the United States West Coast "shrouded in smoke" erupting from 110 large fires across the area, according to NASA. The image, collected from satellite data on Sunday (Aug. 19), shows many sources of smoke spreading across the central United States. Red denotes zones of active burning. "Over 1.9 million acres are or have been ablaze," NASA said in an update on Monday (Aug. 20), adding that new large fires had been reported in Oregon, Nevada and Idaho since the weekend. It's not only the fire that is a concern, NASA said, but also the accompanying smoke. "Smoke from any type of wildfire is dangerous. The smoke released by any type of fire is a mixture of particles and chemicals produced by incomplete burning of carbon-containing materials," NASA said. The agency advised people in areas with heavy smoke to avoid physical exertion outdoors, especially in the cases of children, pregnant women, the elderly and people with cardiovascular conditions. A snapshot of smoke movement across the U.S., shown in an experimental model from the morning of Aug. 20, 2018, reveals dense smoke across the West Coast. Smoke contains many nasty chemicals. All smoke types incorporate carbon monoxide, carbon dioxide and particulate matter (or soot). But smoke can vary depending on the burn temperature of the fire, the materials being burned and how much oxygen is available to the blaze. 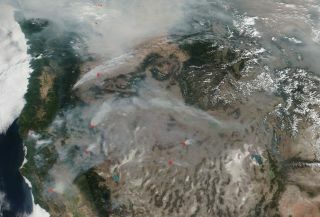 A partial list of possible smoke components from the forest fires, provided by NASA, includes aldehydes, acid gases, sulfur dioxide, nitrogen oxides, polycyclic aromatic hydrocarbons (PAHs), benzene, toluene, styrene, metals and dioxins. You can get real-time updates on the fires at this website from the National Weather Service. NASA also rapidly uploads satellite observation to its EarthData website, which you can see here.